Day 213 of Project 365: Bia Bistrot, a photo by cygnoir on Flickr. Old family friends in town just for the weekend treated us to dinner tonight at Bia Bistrot. I love sharing excellent meals with friends, and Bia Bistrot is one of my favourite restaurants, full stop. I worked up quite an appetite from my run this afternoon, so I had all three courses. Delicious. 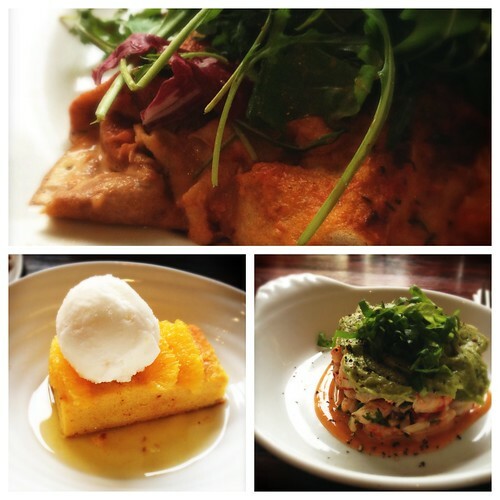 Clockwise from top: buckwheat crêpe with spring vegetables, crawfish with avocado, and orange polenta cake with lemon sorbet.